A list of references on DM from Factbite might be of interest! This obituary for David Munrow appeared in The Times on May 17, 1976. A crumhorn is a wind instrument that dates from the Renaissance. David Munrow (August 12, 1942 - May 15, 1976) was a musician and early music historian. In 1960 David Munrow went to Peru, teaching English under the British Council Overseas Voluntary Scheme. Munrow committed suicide in 1976, while suffering from depression. 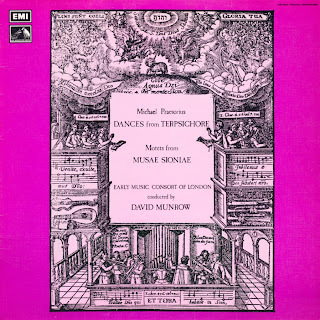 David Munrow was the pioneer in England of the early music revival. David Munrow was keen on spreading the revivalist gospel and his proselytising activity included projects like The Mediaeval Sounds LP which was a documentary record in which he introduced mediaeval instruments. David Munrow lived under pressure and tragically committed suicide in 1976 at the age of 34. David Munrow's passion for early music and musical instruments commenced in 1960 when he was 18. Deller Consort - Alfred Deller, dir and Morley Consort - David Munrow, dir. David Munrow (August 12 1942 - May 15 1976) was a musician and (additional info and facts about early music) early music historian. In 1960 David Munrow went to (A republic in western South America; achieved independence from Spain in 1821; was the heart of the Inca empire from the 12th to 16th centuries) Peru, teaching English under the (additional info and facts about British Council) British Council Overseas Voluntary Scheme. Munrow committed (The act of killing yourself) suicide in 1976, while suffering from depression. David Munrow's suicide in 1976 cut short the career of one of the pioneers and most zealous advocates of the movement for historically informed performance. At that time Munrow pointed out that this was the first film scored entirely for historical instruments, and several of the authentic pieces he used were at the time unpublished. Munrow's own faux Tudor pieces are generally convincing, though they sometimes slip into a moody1970s style that betrays their provenance. Although these days such attention to authenticity is common, even expected, Munrow was one of the pioneers in bringing musicological research and the more immediate practicalities of really old, original instruments and stylistic practice to the level of popular culture. At least one of the pieces goes on way too long--the trying-to-be-realistically-crude Street Music--and Munrow's strikingly weird, avant-garde-like Henry's Loneliness, a truly creepy sequence written for the film that must be the most twisted use of psaltery, harp, and crwth ever devised, seems a bit extreme outside of the movie's context. Munrow was an important figure in the period-performance movement (sadly, he committed suicide in 1976 at age 33), and these recordings show what a class act he and his Early Music Consort of London were. Early-music specialist David Munrow composed it, using period works and his own compositions for an arresting, yet scholarly correct soundtrack. In his short lifetime (1942-1976), Munrow was the leader of the old-instrument movement in the United Kingdom. Munrow led spirited performances, often featuring his own crackerjack recorder playing. David Munrow begins by introducing them one by one, with a spoken explanation followed by a demonstration. Before his untimely death David Munrow pioneered and was to become the acknowledged master of medieval instruments, performing on television, film, and making further recordings. Appointed Constable: ? Daniel Munrow from the mouth of the Lower Little river to Mr.
John Munrow recommended to the General Assembly to be exempt from public duties and taxes, be being sixty-odd years of age. David Torrey (appointed) road overseer from Munro?s bridge to the fork of Yadkin Road. Munrow gave many performances of both pieces, and Recorder Music was included in The Art of the Recorder (EMI Records). A Memory of David Munrow was written for a BBC concert in Manchester at which Munrow was due to play, but he died tragically several months earlier. Thus the music is not a celebration of what he stood for, which might be appropriate now, but an elegy under the impact of shock. Italian culture during the period from the 14th to the 16th centuries was a whirlwind of developing literature and art, and during this period of history Florence was a political and cultural center to rival Milan or Verona. The first CD, performed by David Munrow and the Early Music Consort, covers compositions from the 1300's, with many of the works of Francesco Landini, the most prolific Florentine composer of this period. David Munrow and the Early Music Consort are superb, as I have always found them to be, and John Beckett and the Musica Reservata are equally enjoyable. This website aims to celebrate and inform the work of the English early music pioneer David Munrow (1942-1976). In addition, a short biography will be developed, and a forum initiated for respectful discussion of aspects of Munrow's work. ITV have now progressed this project and I am awaiting contractual and legal matters to be finalised before production can begin. David Munrow blazed like a bottle-rocket across the Early Music scene of the 1970s. His career lasted an all-too-brief 9 years (he died in 1976), but in that time he managed to take the stodgy, academic pursuit of historically informed performance, turn it on its head and shake all the stuffing out of it. The recording stands as a template for our present view of Medieval music, but its influence goes even beyond that: Munrow gave the music a universal appeal that lifted it out of academia and permanently into our concert halls. Munrow, in his usual practice, adds further colour to the music with softly chiming bells. The Early Music Consort of London is one of the pioneers of the 70s' revival of Early Music, and consists of such illustrious names as Christopher Hogwood, James Bowman, Nigel North and of course the crusader himself David Munrow (1942-76), who is responsible for the 15 pages of detailed notes in the booklet. The performances possess a certain degree of rigidity of rhythm, as is typical of many British groups, though the plus/fault of rhythmic freedom is a matter of the listener's personal taste. Subject: Re: David Munrow rsd@sei.cmu.edu (Richard D'Ippolito) writes: >Don't know for sure, but there was an earlier (1965?) very popular >Archiv recording of Preatorious, Widmann, and Schein with early >instruments released as part of DGG's historical series that did the >trick for me. Ah, yes, _Tanzmusik der Praetorius-Zeit_, a classic recording. David Kastrup has confirmed with a very simple and elegant experiment a result known to those who have studied the motion of the bowed string that in the transition from one bowing direction to another the string "rolls" about 30 degrees. David Munrow (LONG) Here is a brief biography of David Munrow, taken from a radio programme, introduced by Michael Oliver, broadcast on BBC Radio 3 some years after his death. The empty space left by David Munrow's tragic disappearance from ancient music studies and performances has never been filled. Ecco La Primavera is probably David Munrow's masterwork, and one of the best-sounding records ever made. The rediscovery and performance of the Italian music of the trecento is one of the most important cultural events of the late 20th century, and Munrow's care in solving philological problems shows a magic touch in the ability to preserve both musicological needs and musical pleasure. David Munrow's collection of Music of the Gothic Era, recorded back in 1975, was hailed upon its release not only for its historical value, but also for the imagination that Munrow and his colleagues showed in realizing manuscripts that often are as open-ended as they are ancient. Munrow was a scholar, but he was anything but a dusty person, and his death not much later at the age of thirty-four was a major disaster for the Early Music field. Again, Munrow relied upon a diverse (but, in contrast to most early efforts to bring this music forward, not inflated) cast of singers and instrumentalists to demonstrate the music's continued viability. Munrow makes no mention of bowing psaltries in his (quite reputable) overview of musical instruments, and Michael Praetorius did not mention them when he cataloged all known instruments in the 16th century. This is reproduced (in fl and white, alas) in David Munrow's _Instruments of the Middle Ages and Renaissance_. It is _Instruments of the Middle Ages and Renaissance_, by David Munrow and the Early Music Consort of London. David Munrow was the director as well as performer on recorder, fluet, shawm, crumhorn and bagpipes. Munrow's talents are well suited to this kind of medieval music. A great debt is due to Ian Bent, Norman Clare, David Munrow, Jeremy Tilston and the performers of these pieces for the effort that was required to exhume them from the distant past and make them available today. David Way is the current head of Zuckermann Harpsichords, and he will certainly sell you a kit. David Munrow was certainly no amateur, but I believe he began that way). David Munrow and Walcha on Toshiba EMI from Japan I had never listened to David Munrow, but because of the interest generated by this news-group, I bought some of the Toshiba EMIs from Tower. H?ndel: O ruddier than the Cherry, from Acis and (LP: The Art of Galatea the Recorder) (Robert Lloyd, bass; Early Music Consort of London; The David Munrow Recorder Consort; David Munrow) J.
Bach: Schafe k?nnen sicher weiden, from Cantata (LP: The Art of 208 the Recorder) (Norma Burrows, soprano; Early Music Consort of London; The David Munrow Recorder Consort; David Munrow) J.
Bach: Sonatina from Cantata 106 (LP: The Art of (Early Music Consort of London; The the Recorder) David Munrow Recorder Consort; David Munrow) J.
Mischa Maisky and Martha Argerich are the respective instrumentalists as we hear the Sonata for Cello and Piano No. 4 in C. Some early music intervenes: Three songs from the 15th century court of Burgundy by Guillaume Dufay, performed by the Early Music Consort of London under the leadership of David Munrow. A huge leap to the twentieth century for some Lou Harrison, as we hear his Serenade for Guitar and Percussion played by guitarist David Tanenbaum and percussionist William Winant. David Garland, host of WNYC's Evening Music and Spinning on Air, is also a composer and a performer. Early in his career, Christopher was a key member of the Early Music Consort of London, which was directed by David Munrow. The Early Music Shop is promoting the re-release of some of the original David Munrow recordings, re-mastered and re-packaged using the 1970s masters by Testament. This CD is part compiled from the soundtrack of the film in which Keith Michell played Henry, and which secured David Munrow?s reputation as a performer.